Use Start/Control Panel/Uninstall and remove all exiting versions. Download the styledump full package (version 1.5.0). Unzip to an empty folder. Right click on Setup.exe and select Run as Administrator. When prompted, please accept the default file location, and do not allow replacing newer files with older ones. Download the styledump_update package (version 2.0.1). Copy the files to the C:\Program Files\StyleDump folder. When prompted, please allow the operating system to replace older files. The listings include midi events, meta events, sysex events and any special commands, where known. Wherever possible and appropriate, the contents, including sysex commands, have been translated to English descriptions and decimal values. 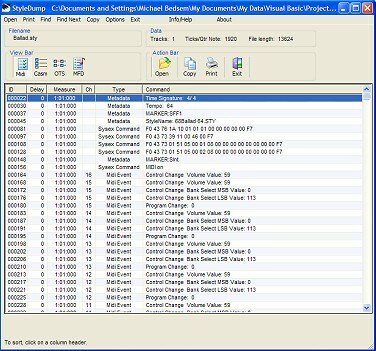 The displayed information may be sorted, searched, columns rearranged, printed, or copied to the clipboard. While the program MidiPlayer includes some of these capabilities, StyleDump works on the raw data, whereas MidiPlayer performs inter-instrument conversions and file corrections) and, it is much faster. This page updated on April 6, 2019. Order any PSR Tutorial Resource set or make a donation to become a "Supporting Member" for life! (c) 2019 PSRTutorial.